As athletes our training logs are filled with pounds lifted, plays made, distances traveled and paces held. There is no doubt these are vital factors to increase performance, but how can the timing of these practices play into improved performance? In this post I will review the effects of training at different times of the day and reveal important facts that can help you in your next competition-so keep reading! Circadian Rhythm is the body’s internal clock that regulates autonomic biological processes including sleep-wake cycles, hormones, body temperature and more. The body’s rhythm changes in a predictable manner throughout the day. This means that an individual’s arousal, strength and hormone release (all factors that affect performance) are different at 7am than at 3pm. Let’s explore some studies that used this knowledge in relation to performance in athletics. There are many studies exploring the best time of day to exercise leading to maximum performance. One study testing maximal power output in the morning vs. evening concluded the greatest maximal power output was in afternoon training sessions as opposed to morning sessions. Another study found similar results concluding that in a test of repeated sprints, evening performance had a greater power output than the morning for the first sprint of six. However, after that first sprint of increased power there was no significant difference between morning and evening training sessions on the next five repeated sprints. Meaning, that while maximal power is shown to be greatest in an afternoon training session, fatigability is not effected by the time of day. Further studies support these conclusions finding that sub-maximal exercise performance is not affected by the time of day. For clarification, a sub-maximal exercise might be a longer swim set or run where at no point are you going all out, while an example of a maximal exercise is finding your 1-rep max for a back squat in the weight room. In recap, these studies support that strength training performance is the best in the afternoon while endurance or cardio-based training performance are not correlated with time of day. Specificity is the notion that practice should reflect the sport/competition type you are training for. 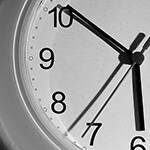 For this post, this principle corresponds to the timing of your practice in relation to your competition time. When training at a specific time of day regularly, your body increases it’s work capacity at that specific time. This becomes important because if an athlete’s competition is in the morning but he is only training in the evening, he will fail to reach peak preparedness. Thus, Take a look at competitive swimmers, they typically train in the early morning and then again in the afternoon. This is perfect prep for most major competitions that hold swim trials in the morning and finals in the afternoon/evening. While maximal power increases (in the afternoon), fatigability remains independent of the time of day. Sub-maximal exercise is not affected by the time of day meaning that is no ideal time for endurance and cardio training throughout the day. Include training sessions at the time of day your competition will be in maximize training adaptations. Racine’s, S. et al. Maximal power, but not fatigability, is greater during repeated sprints performed in the afternoon. Chronobiol Int. 2010 Jun;27(4):855-64. Racinais, S. et al. Morning versus evening power output and repeated-sprint ability. Chronobiol Int. 2005;22(6):1029-39. Reilly, T and R. Garrett. Investigation of diurnal variation in sustained exercise performance. Ergonomics. 1998 Aug;41(8):1085-94.